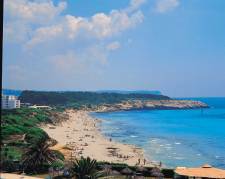 Cala'n Bosch is tucked away on the southwest tip of Minorca, 8km from the historic city of Ciudadella. Set around two sandy coves, Cala'n Bosch is an attractive, purpose-built resort, the focal point of which is a pleasant yachting marina. A sprinkling of shops, bars and restaurants dot the resort and it's gentle pace of life and tranquil atmosphere suits older couples and families seeking a peaceful holiday. There is more to Minorca than just its beaches. The island is in fact home to one of the largest concentrations of pre-historic monuments in the world and therefore has earned a reputation as an open-air museum. Some of the main attractions include: ancient 'navetas', stone structures which resemble upturned boats; imposing 'talayots', large stone look-out mounds; and the Stonehenge-like 'taulas', huge stone blocks carefully balanced in the shape of the letter 'T'. Interestingly, taulas are unique to Minorca although their precise nature still remains a mystery. Why not explore some of these intriguing sights which provide an excellent insight into Minorca's past? 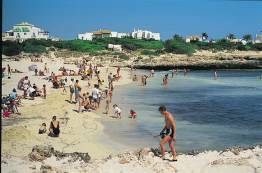 Cala'n Bosch has two beaches that shelve gently and are made up of soft, light sand with some pebbles. 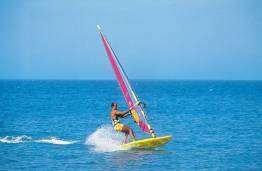 Why not try out some of the watersports on offer such as scuba diving or simply sift sand through your fingers as you lie back, bask in the sun and feel its warmth on your face. There are a few tourist shops dotted around the marina so that you can take home a souvenir from your holiday, however, the main shopping area can be found just north of the marina and offers supermarkets for all of those holiday essentials. The city of Ciudadella offers more comprehensive shopping and is reached easily by bus. Nightlife in Cala'n Bosch is generally low-key. Most evenings revolve around a meal or drink in one of the cafes or restaurants that surround the marina. The nearby city of Ciudadella offers has a host of bars which have a distinct Latin flavour about them while the busier resort of Cala'n Forcat is the place to head to if you want to dance the night away at a disco. 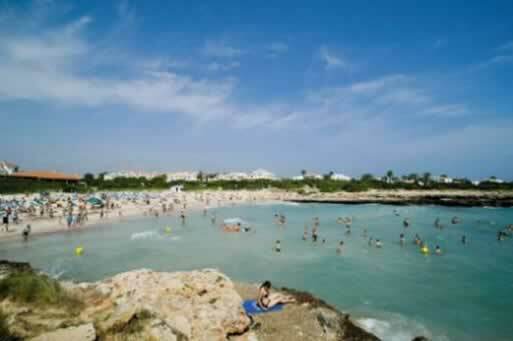 However, there are a few lively bars and a nightclub in Cala'n Bosch itself and karaoke is particularly popular. So, if you fancy yourself as a bit of a budding pop star, Cala'n Bosch could be the holiday destination for you! A short bus journey whisks you from Cala'n Bosch to nearby Ciudadella. 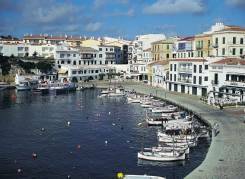 It's an attractive and typically Spanish city which, up until the British occupation of Minorca in 17th century, was the capital of the island. Ciudadella boasts an enchanting old quarter which is a joy to discover. Why not take a stroll through the maze of narrow cobbled streets which fan out from the Gothic cathedral, marvel at the opulent palaces and mansions of Minorca's former nobility or perhaps just relax under the shade of a palm tree and soak up the characterful atmosphere around the main square. Any visit to Ciudadella should also include the picturesque port, home to a host of tapas bars and fish restaurants. It's particularly nice at the end of the day when you can sit down with a glass of wine in hand and admire the bobbing silhouettes of yacht masts against the bleeding colours of the setting sun. Eating out in Cala'n Bosch is a joy as most of the resort's restaurants and bars are clustered around the charming marina. You can choose to eat al fresco in one of the many quayside establishments or simply settle down with a glass of wine in one of the cocktail bars which line the water's edge. Menus vary from light snacks to tapas dishes. Why not try 'tumbet', a ratatouille of aubergines, peppers and potatoes in olive oil, or perhaps 'lechona asada', roast suckling pig. Round your meal off with 'herbas dulces' - a delicious local liqueur made from aniseed and herbs.